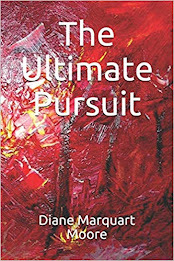 Border Press announces the publication of Diane Marquart Moore’s latest book of poetry, The Ultimate Pursuit, which is now available. According to the blurb on the back cover, The Ultimate Pursuit includes explorations of a Persian transmigration inspired by the author’s lifetime readings of the Rubaiyat of Omar Khayyam and memories of Persia during her sojourn in this country, 1973-75. This volume offers a brief glimpse into the culture and history of Persia in lyrics spoken by transmigrated souls, beginning with a rooster who crows day-long on the banks of a Louisiana coulee. The book offers a non-traditional excursion into a culture 2500 years old. The Ultimate Pursuit includes a section of poems about Persia selected from Farda, published in 2009. Moore’s deceased brother Paul painted the brilliant-hued cover and provided many paintings for covers of the poet’s 31 books of poetry. Rose Anne Raphael of New Iberia, Louisiana rendered the elegant, imaginative drawings within The Ultimate Pursuit. During her sojourn in Persia, Moore wrote for The Yaddasht Haftegy in Ahwaz. She has also written non-fiction and young adult books about her life in the oil patch of Khuzestan Province. The Ultimate Pursuit is available online from Amazon and from Border Press, P. O. Box 3124, Sewanee, Tennessee. “The silence of too much winter,” I once wrote in a poem, and I might add, “the winter of too much wetness,” as I look out at wet leaf piles heaped in the backyard. A prediction of fog and more rain evokes in me a desire to visit a place I love — the desert of southern California. 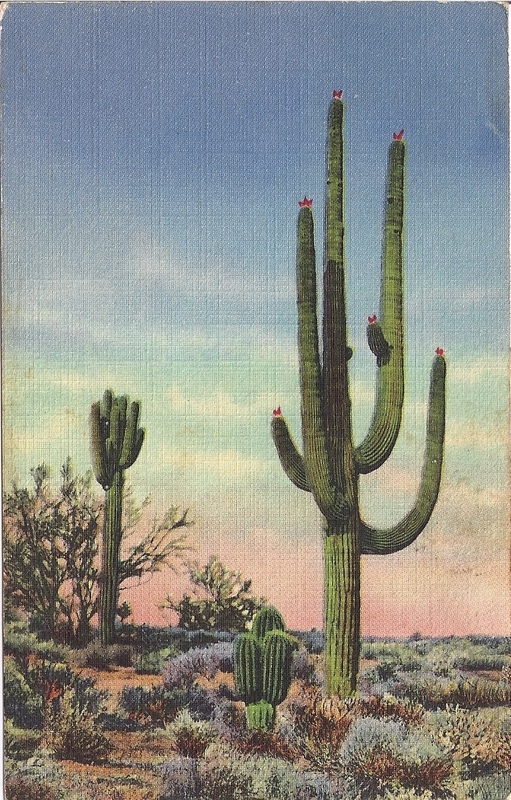 The feeling is further enhanced when I open a folder that contains copies of postcards my mother collected on a trip to California in the 40’s — cards on which paintings of the desert were shown. 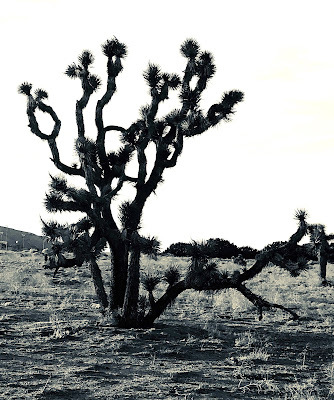 The paintings appear on linen cloth cards, and, in particular, I was drawn to two: one of smoke trees in a desert wash and another of Joshua trees jutting into a blue sky. 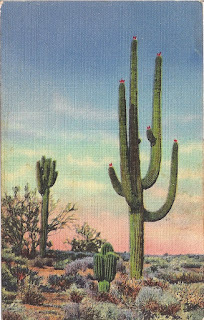 A great classic book about the desert suitable for the kind of droopy weather we’re experiencing was written by John Van Dyke. It’s simply entitled The Desert, and if you read this tome, you might feel like trading locales, swamp country for desert terrain, for at least a week or so. 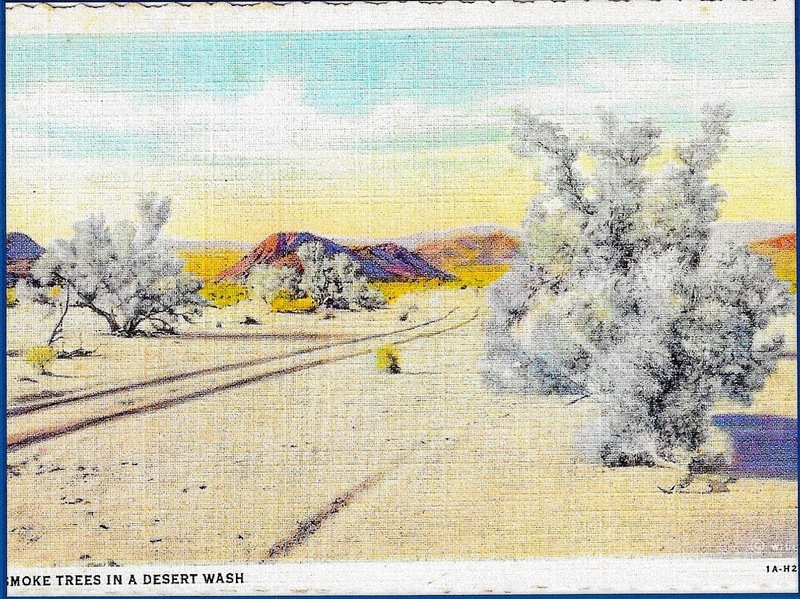 The author spent three years living in and studying the environment of the desert from a naturalist’s point of view, and he paints with elegant prose what is portrayed in the renderings on the postcards I inherited from my mother. As I finish up a book of poetry I’m writing — some of the poems based on the desert in Khuzestan Province, Iran — I’m reminded of lines in the Rubaiyat of Omar Khayyam: “The worldly hope men set their hearts upon, /turns ashes or prospers, and anon,/like snow upon the desert’s dusty face,/lighting a little hour or two is gone.” Since I’ve memorized many of the quatrains in the Rubaiyat, this verse particularly resonates with me because it reminds me of how our everyday pursuits center on vanity and of how much we avoid the desert places if we can. But it’s there that we encounter the Self and our need for a more spiritually centered life. when the universe becomes a plant. 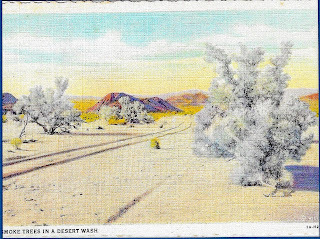 And as I write this, the sky refuses to clear, so I continue going through my mother’s postcards, envisioning her delight… and loving that she, an intrepid adventurer, taught me to appreciate desert life. Imagine giving up your morning coffee because you blamed the fragrant, energizing beverage for causing digestive and other health problems on the one cup you consumed daily. Imagine the loss of morning joy and energy from coffee withdrawal. Then read about all the benefits of coffee, and you can envision how two months of being without my morning coffee affected energy levels for me — not to mention the awful headaches brought on by withdrawal from this beverage. But what a delicious return to this commodity; in fact, after crude oil, I’m told that coffee is the most sought after commodity in the world, and I’ll drink to that. Both sets of my grandparents advised me as a child against drinking even diluted coffee milk because it would stunt my growth and impair my thinking abilities. However, the scent of coffee brewing in their households was a delicious smell on mornings when I spent time with them for a week or more during summer vacations. Although my paternal grandfather, Emerson Lavergne Marquart, was of German descent, he had adopted the Cajun way of brewing good coffee after his marriage to my Cajun grandmother. He used a battered white enamel drip pot to make the dark French roast coffee that I yearned to taste as a child, but he forbade me to have even a demitasse cupful that he used to serve adults just waking up from an afternoon nap. In my maternal grandmother’s kitchen, coffee was brewed only in the early morning, and she was the guardian of a pot that produced a wimpy, light brown liquid she claimed would keep me forever short (which I achieved without partaking of the coffee milk for which I craved just one taste). But, then, she issued health and safety bulletins at every turn to the extent that I'm still afraid to be in an indoor tub of water during lightning storms, feel that I must have my feet covered no matter the weather or locale, and, she emphasized, I must never mention that I had a bathroom call. In addition to the ban on coffee, she advised us to never drink wine as it would cause us to go crazy. It took me awhile to get over the latter admonitions, but I finally gave in to the idea that a cup of coffee and four ounces of wine daily wasn’t going to kill me or make me crazy. Coffee consumption can be traced back to Ethiopia and a goat herder named Kaldi who noticed that his goats didn’t want to sleep after they had consumed berries from a particular tree. He’s said to have reported this to the abbot of a monastery who decided to brew a drink using the berries and discovered that the concoction would keep his monks awake to do their prayers throughout the night after partaking of this beverage. During the 18th century, coffee seedlings were planted in the Royal Botanical gardens in Paris, and a seedling was transferred to Martinique where it became the parent of coffee throughout South and Central America. And so it began…and so the coffee industry is now a billion dollar industry! During the 1940’s, the musical group, The Ink Spots, gave coffee a new name through their song, “Java Jive,” a song so compelling that my father-in-law decided to use the term “java” on a trip to New York City — a famous trip in which my sister-in-law transported every pair of shoes she owned in a washtub and forced my husband to carry this shoe holder through the lobby of a hotel. As if that wasn’t enough embarrassment for my husband, my father-in-law took him to a dime store restaurant, climbed on one of those red, plastic covered stools popular in the 1940’s, and ordered “a cup of java and some flapjacks” in a loud voice. The Clampetts of the "Beverly Hillbillies” couldn’t have played hillbilly better, but my husband never visited New York City again. We only passed through the Big Apple (got lost and bought a cup of coffee at a gas station) on the way to a military assignment in Maine. And for all of us who call ourselves poets, what would we have done during the Hippy or Beatnik eras had it not been for poetry readings at coffee houses? Even the Brits had their coffee houses, 300 of which existed in London as early as the 17th century. Thomas Jefferson once acknowledged that coffee was the favorite drink of the civilized world, and I heartily agree. I’m feeling much more civilized since I resumed my one cup in the mornings. 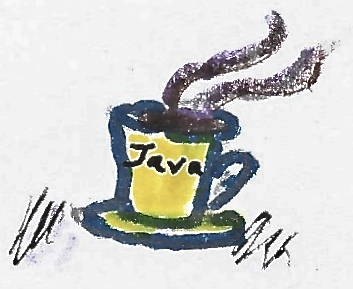 Viva Java!